When we lived in Raleigh, Mike and I had a small Master suite. You can see a tour of it here. We loved that little room in the back of our house. The light was wonderful, but it was quite small and barely could handle a queen size bed. So when we were coming up with the design for this house’s Master Suite we knew we wanted it to feel spacious. We also knew that Master Suites sell houses so we wanted to create a space that would be more than we necessarily need. When we completed the design we were shocked by the amount of space it left us for this space. It was more than we ever dreamed or needed, which was perfect because it is a true suite. So today I wanted to share the design we have come up with for this space and our inspiration. 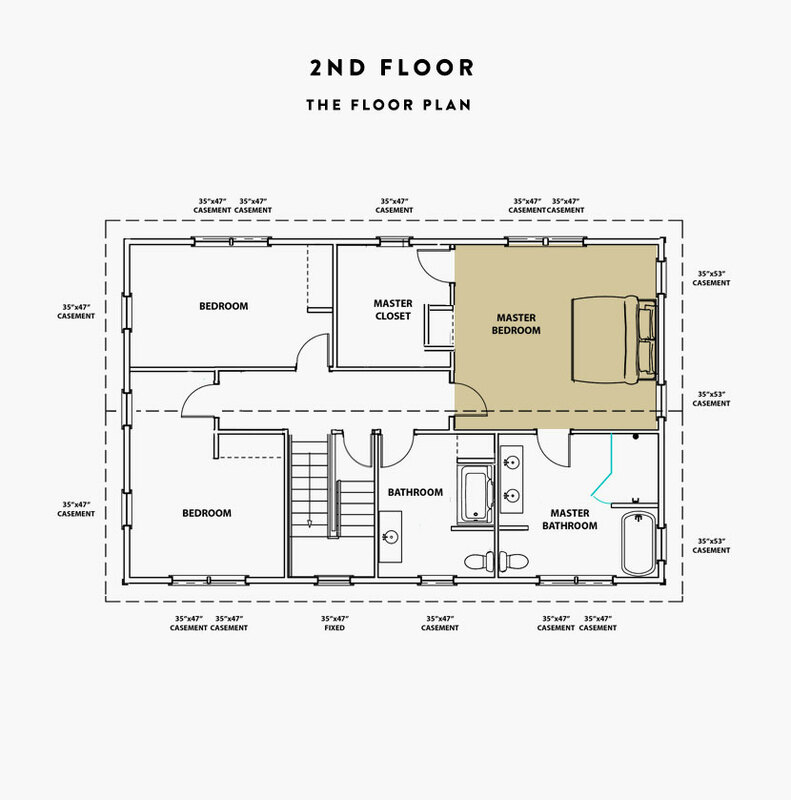 This will be the first room on our Second floor I will share about so don’t miss the floor plan below for reference. 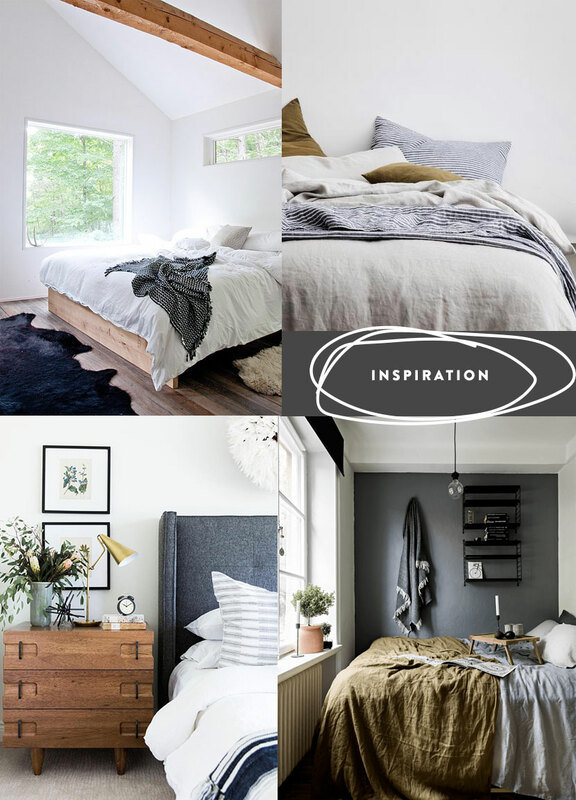 I realized this last weekend that I have been trying to pin down our style and while I was hunting through images for inspiration to show you guys what was in my head I came to terms with the fact that our style is Scandinavian Farmhouse. It isn’t Farmhouse Modern…or even rather Modern Farmhouse…it is Scandinavian Farmhouse. Now you are like, okay Megan, really? But I am serious. Mike and I both love minimalism, but we also love the natural and the things that feel cozy and warm and bring life to a space. I value a minimal and calm home that nods to nature and the seasons. This typically means neutral tones that will transition with every change of our lives. I realized after a lot of research that this is exactly the style of a Scandinavian Farmhouse. Thus, here we find ourselves. 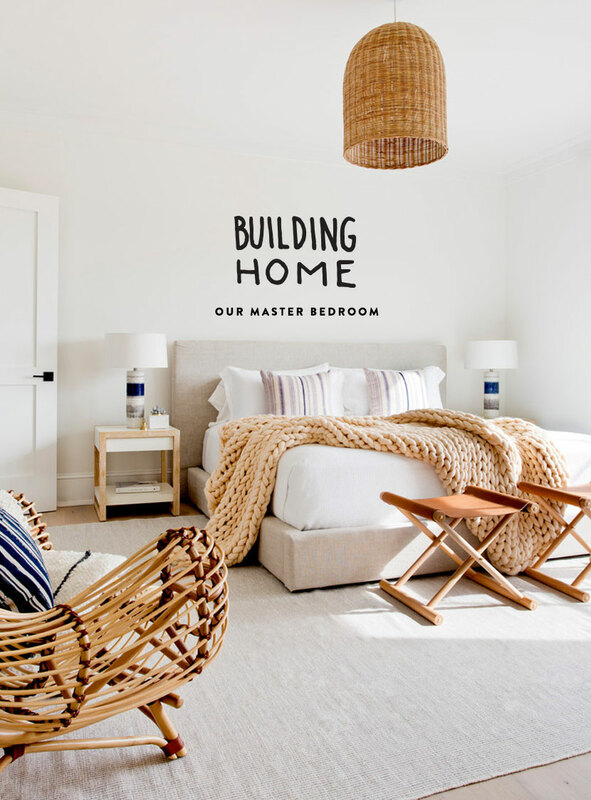 No more Modern Farmhouse on this house we are embracing this new title for the house now. That said, here is the floor plan upstairs for your reference. The Master is right above the Kitchen which I really like honestly. We located all of our plumbing on the side of the house where our utility closet was in order to keep it simple for running everything. Though our walls are full of wires and ducks and so on because we only have 1 wall that carries through the whole house, it has worked well. Our Master Bedroom has one built in cabinet so we will not have a dresser. This will hold our everyday sort of items. Our closet will store seasonal items and potentially transition as a nursery when the time calls for it. Mike and I don’t have a lot of clothing so we don’t really need a walk-in-closet persay, but it is great for resale down the road. We designed the master to have PLENTY of space for a King bed. We knew it was time to jump the gun in our marriage after starting with a full and moving to a queen. When we had Hayes we wanted the space so much but didn’t have it. Then this summer our rental had a king and it sold us on the idea. So we plan to make the jump, which means everything we used for our bedroom will now be used for our guest room and we will be refreshing our space with a whole new bedding setup. 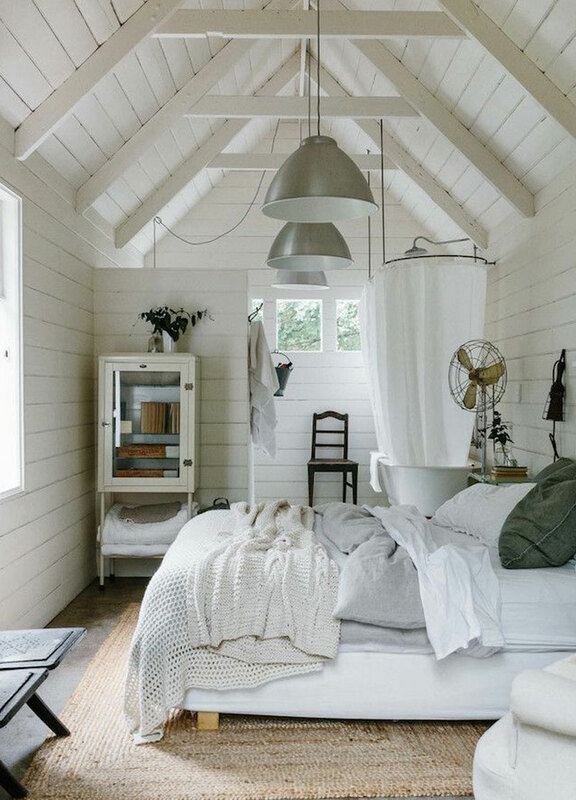 I am a HUGE fan of Linen bedding. It is so comfy and I love how undone it even looks beautiful so we plan to invest in another set for our room. We have In Bed sheets and love them. They have stood the test of almost 3 years of year and still look new. We cannot rave about them enough. 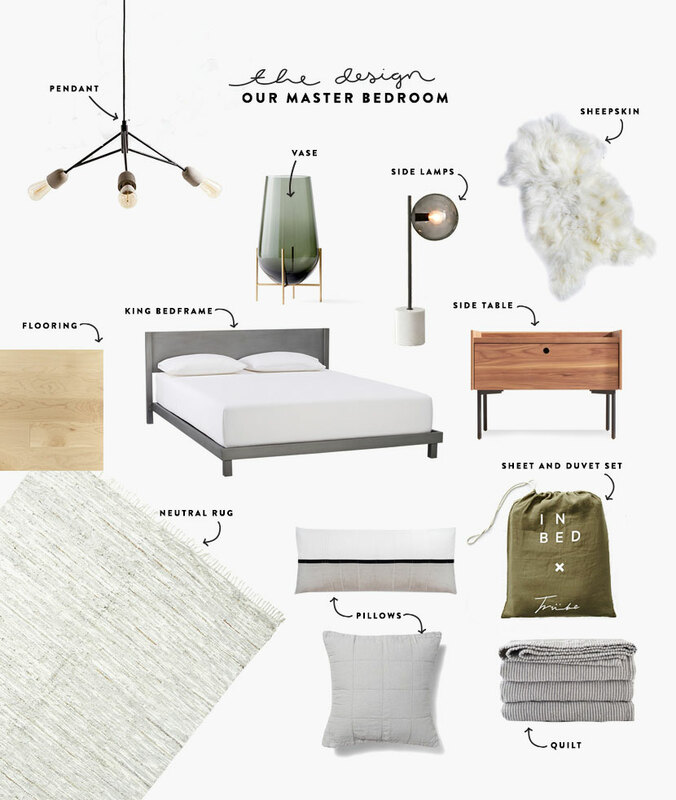 So, I am dreaming of the Moss green color for our room as our pop in our room. I love Olive and it will tie into our downstairs bath design as well as some other details we have in the house. Green and Blue tones are our colors in our house as they complement the natural world we live in the best. To keep the space warm we plan to layer rugs and sheepskin on the floor. I also am very excited for the first time in my life to have a proper nightstand with a drawer and a light. We never had it even in our other house, but it has come time. I mean I am about to be 31 and it makes me feel like I am a proper adult. I love to read before bed instead of scroll so this was high on the list for me. The rest of the room will be fairly empty. Since our ceilings are 8 Ft. we opted for a simple pendant. I loved the concrete details on this one from Urban Outfitters (who would have thought?!) so I picked it up at a sale recently. We splurged on our side tables from BluDot because we loved them so much and caught our bedframe on a sale from CB2 a while back. We love the mix of textures that will be in the space as well. One last thing we did think about when designing this space was because we have lower ceilings in here, we opted for a lower bed and nightstand in order to make the room feel taller. I think it will help tremendously. Though the ceilings don’t feel that low to me currently. Next week I will be sharing about our Master Bathroom, which I am SOOOO excited about! I cannot wait to show you guys! The tile gets delivered this week so it is coming together! If you want to see the other posts you can see them all here. So tell me what you think of the space?! I am still trying to decide on art and wall decor, but I feel this is a great solid base so far! Y’all will not regret the king size bed! I suggest them to every married couple 🙂 Also love the pendent and hit of green coming! Can’t wait to see everything finished (and I know y’all are ready too)! We are living vicariously through the fresh exchange! Congrats! YAY! I am just so thrilled to see how it all comes together! love – it’s going to look great – only suggestion is given the number of hard surfaces/edges, maybe consider an upholstered bed or headboard…it will soften things up, absorb sound, and be a little more forgiving towards little morning visitors, and you can still make it work with the scandi look by going with gray/soft flannel and clean lines….can’t wait to see the finished room!